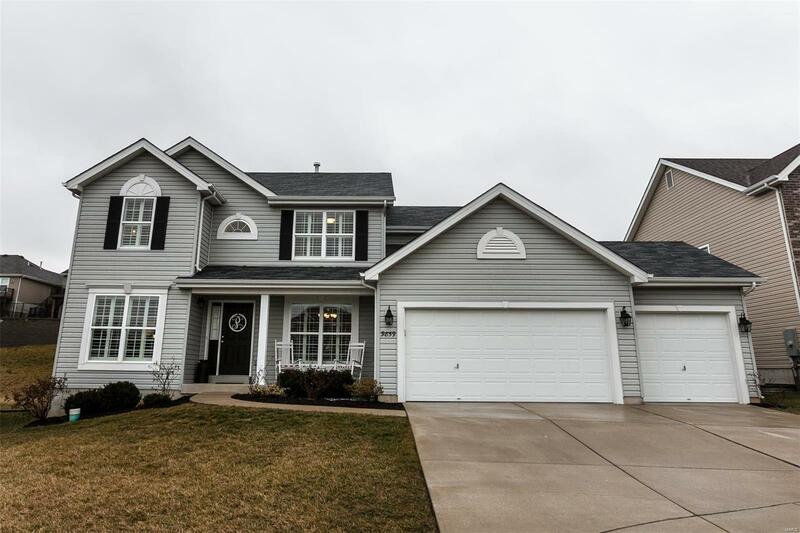 You'll love coming home to this tasteful and timeless 4 bedroom, 2 1/2 bath home, tucked away on a cul-de-sac, that is impeccably cared for in desirable Grant's View subdivision. The open floor plan is accentuated with solid hickory floors on the main level, exposed staircase with custom iron balusters leading upstairs and down to the partially finished lower level, and plantation shutters throughout. The great room offers a gas fireplace with a raised brick hearth and bar open to the breakfast room with bayed window and door leading to the fenced back yard. Follow through to the kitchen with large center island to the main floor laundry, 3 car attached garage, or the butlers pantry into the dining room. The main level is completed with an office behind french doors. Head upstairs to 3 bedrooms plus a phenomenal master that makes a perfect retreat. Not to mention, it's in the Lindbergh School District within walking distance to Grant's Farm, bike trail, & new St. Louis County Library.